The average score received by Jan, Alicia, Sue and May in a recent Math test was 76 marks. Jan and Alicia both got 8z marks each while Sue got half of May's marks. How many marks did Sue score for the test? Express your answer in terms of z.
Simplify 16d + 9c - 9d - 2c. Subtract 11z + 9w + 8q from 19z + 13q + 25w. Sara had 100 sweets. She gave some sweets to k pupils and had 12 sweets left. How many sweets did each pupil get? 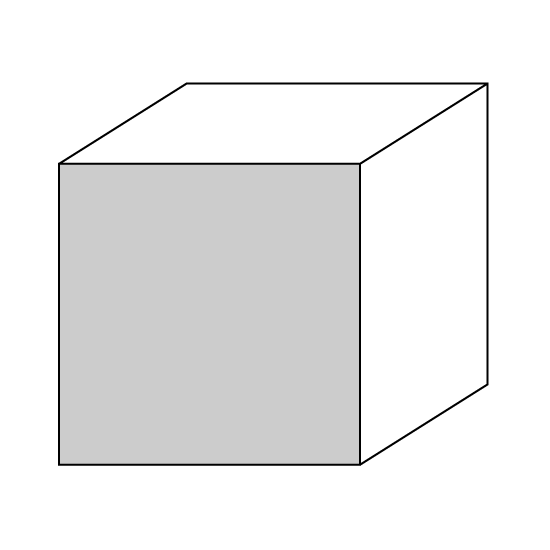 The area of each face of the cube in the figure is b2 cm2. Find the volume of the cube in terms of b. If b2 = 36, find the volume of the cube. Jimmy and Kenny had $180 in all. Ken had $(12b + 6) more than Jim. How much did Jim have If b = 7? Gary weighs x kg while Jim weighs 2y kg. Find the average mass of each boy in terms of x and y. If x = 47 and y = 19, find the average mass of each boy. Mary baked 400 cookies. She ate 2p of them and divided the remainder equally among her 4 friends. Find the number of cookies each of her friends received in terms of p? If p = 12, how many cookies did each of her friends receive? Find the value of 5a - 9b2 + 3c when a = 10, b = 2 and c = 12.